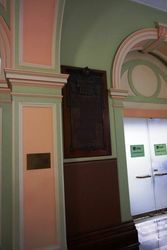 The brass honour roll commemorates the hospital staff who served in World War One. 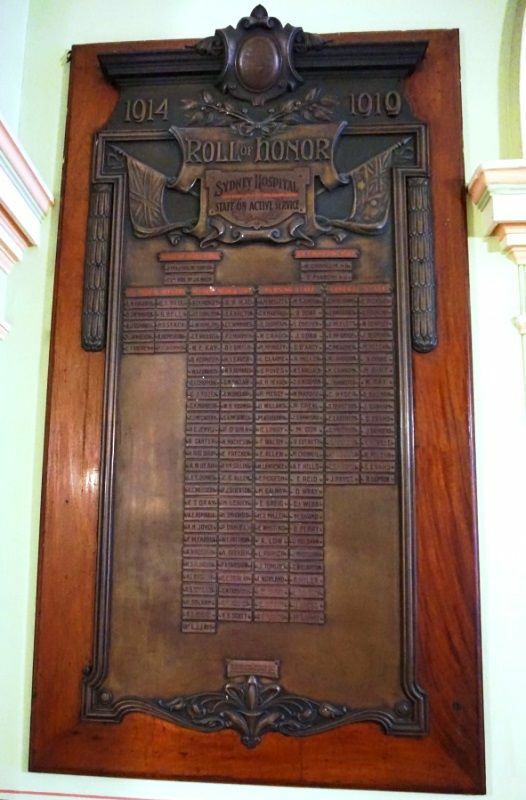 SYDNEY HOSPITAL HONOUR ROLL. —— In the vestibule of Sydney Hospital last week, Mr. David Storey, Acting Minister for Public Health, unveiled an honour roll containing the names of members of the directorate and the staff of the institution who have gone to the front. The board was presented by the president of the hospital, Mr. A. E. Jaques, and the names which appear upon it are those who were on the staff at the outbreak of war. A further board is to be prepared for past resident medical officers and students of the clinical school. 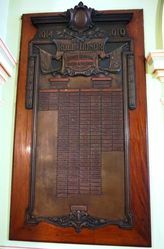 Mr. Storey said he uncovered the honour board with most affectionate and profound reverence to the memory of those who were gone, and admiration for those that were still operating in the various arenas of this desperate war. Amongst the names on the board, said Mr. Storey, were those of two directors of the hospital. One of them, Colonel A. J. Onslow Thompson, gave his life for the nation on the hills of Gallipoli. They were glad to see Dr. Nash and Dr. Fiaschi back again, also Dr. Dunlop, the medical superintendent; after having risked everything that we might remain free. Out of the 46 members of the resident medical staff who had gone, four have been killed—men of great promise in the medical profession. Their names were Dr. B. C. A. Pockley, who lost his life at Rabaul, Dr. J. E. Donaldson, who was the first student to be enrolled in the clinical school, Dr. A. C. Jekyll, and Dr. W. R. Aspinall. Forty-seven from the nursing staff, including the matron, Miss Creel, were also included on the board; and of the general staff 29, including the secretary, Mr. C. H. Helsham, had gone. One member of the general staff had been killed, Mr. James Bannister. Quite a number of the students of the clinical school had also gone to the front, and, unhappily, two had been killed, viz., Dr. Muir Smith and Dr. Roger Forest Hughes. Reference was also made to the fact that a number of those whose names appeared on the board had won distinctions. Amongst those was Dr. B. J. Newmarch, who left with the 1st Contingent as lieutenant-colonel of the 1st Field Ambulance, and is still at the front. He was decorated with the C.M.G. Sydney Morning Herald (NSW), 4 December 1917.